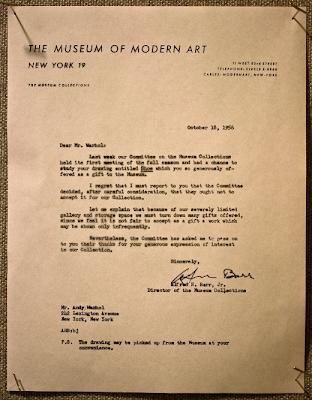 Sooo Andy Warhol donated some work to MOMA to be displayed in 1956, they rejected it and here's the letter (thanks TAC). Something tells me that Alfred H. Barr Jr. probably isn't the Director of the Museum Collections anymore... idiot. An important lesson for artist's of today!